Barely four months after it unveils the GS football boot, Nike has unveiled the follow up model to the boot – the new Nike GS 2. Stands for Green Speed, the new Nike GS 2 is said to be the company’s lightest football to date and was conceived using recyclable as well as renewable materials. At a glance, the new Nike GS 2 is almost identical to its predecessor – from its weight of 160 grams (for size 9 boot) down to its raw materials. However, the biggest difference between the new Nike GS2 and the original GS is that GS2‘s upper has been treated with a layer called All Conditions Control (ACC) which first appeared on Nike CTR360 Maestri III. 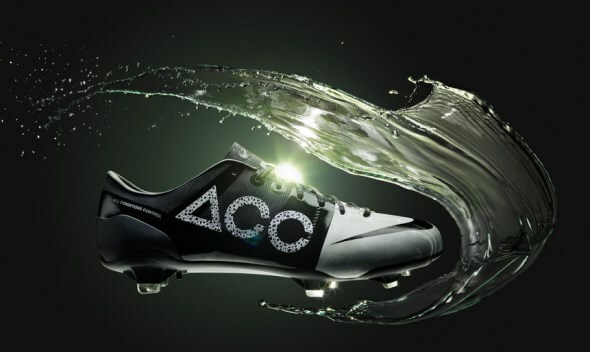 The all-weather ACC treatment is there to help provide consistent level of friction between the boot and the ball whether in wet or dry condition. Of course, there is also a huge ACC insignia in safari print on the Nike GS 2 boot to further differentiate between the booth and the original Nike GS. While the original Nike GS football boot was not officially released in Malaysia, the new Nike GS 2 will be made available in Malaysia exclusively at Match Up – a new football specialty store located at the newly renovated third floor of Mid Valley Megamall, Kuala Lumpur – this coming Sunday, December 2 for RM 949. Head on to Nike Football Malaysia’s official Facebook page to learn more.